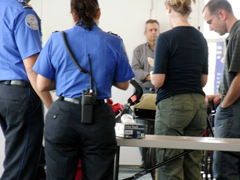 The most obvious example of the tentacles of security impacting the way we travel is the work of the Transportation Security Administrations (T.S.A.). Long-gone are the days when someone could rush into an airport, buy a ticket and then beat a speed record going from the ticket counter to the actual doorway of the plane. Also gone are the exciting days of being able to go to the gate in advance to wait for a close relative or friend to arrive on the next inbound flight. I took the Capitol Limited Amtrak train from Washington, DC to Chicago. The journey was most relaxing, and so was the transition from land to rail. We arrived at the refurbished Union Station in Washington, checked in at the ticket window with no wait, and were directed to seats in a special waiting room for passengers with sleeping car arrangements. I must confess that this was a special privilege; a convenience that I was willing to and able to pay extra for. Twenty-five minutes before the train was scheduled to depart, we were escorted through a door that took us right to the train. Climbing the steps to the car with luggage was more challenging than boarding a plane, but we made it. What we would otherwise have checked on an airplane, we simply put on a luggage rack on Amtrak. It stayed there for nearly 18 hours, and as has always been the case on previous journeys, it remained undisturbed the entire trip, even though anyone could have grabbed the suitcases and absconded with them. We went to our room, enjoyed watching the bustle around the train until we left at our appointed hour. A few minutes later, the conductor scanned our tickets. No muss; no fuss; no quizzical looks; no disrobing; no x-rays. Beside having terrific sleeping accommodations, we had food that was second to none. The journey went through Appalachia, which was both beautiful and haunting, because the landscape was dotted with pockets of poverty and environmental scars. We arrived at Chicago, although late, and could easily unload our luggage and walk to the station. Only at that point were we confronted with the inconvenience of security. Taxis could no longer drive into the tunnel by baggage claim to pick up passengers. We had to lug our belongings some distance to the street. Not fun, but acceptable. Like most passengers on the train, I would like to see Amtrak greatly expanded and equipped with more modern technology. However, I hesitate to push too hard for this change, because I feel as if train travel is a hidden American secret. It’s possible that if terrorists targeted trains, they would have much more success than they have with planes. So I enjoyed the trip, was pleased that it was entirely the work of a government agency rather than a private corporation, and hoped that these glory days would continue as long as possible.